The American Israel Public Affairs Committee (AIPAC), which holds its annual policy conference in Washington, D.C., beginning Sunday, is sometimes referred to as the “Jewish lobby.” But its mission is as an Israel lobby, and when it comes to public backing for that country in the U.S., evangelical Christians are even more supportive of Israel than American Jews by some measures. Pew Research surveys find that similar shares of Christians (29%) and Jews (31%) say the U.S. is not supportive enough of Israel. 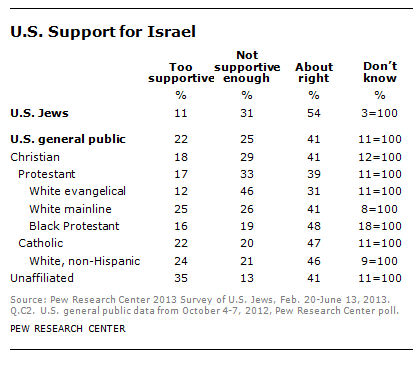 Among white evangelical Protestants, nearly half (46%) say that the U.S. is not providing enough support for Israel. When asked whether God gave Israel to the Jewish people, more Christians (55%) than Jews (40%) say yes (although virtually all of the discrepancy is explained by Jews’ lower levels of belief in God overall). And the share of white evangelicals saying that God gave Israel to the Jews (82%) is on par with the percentage of Orthodox Jews who believe this (84%). This year’s conference comes at a sensitive time for AIPAC, which has been at odds with the White House over a Senate bill that would impose new sanctions on Iran for its nuclear program. When we asked Americans in 2012 what the U.S. should do if Israel attacks Iran to stop Iran’s nuclear program, 64% of white evangelicals said “support Israel,” while just 39% of the general public agreed. Meanwhile, U.S. Secretary of State John Kerry is trying to broker a peace agreement between Israel and the Palestinians amid a Palestinian-led, international movement of “boycott, divestment and sanctions” directed against Israel as a response to the Jewish presence in the West Bank. When it comes to the long-standing conflict between Israel and the Palestinians, asked whether they sympathize with either side, 72% of white evangelicals sided with Israel in the dispute while 4% picked the Palestinians, according to a March 2013 survey. Among U.S. adults overall, 49% sympathized more with Israel and 12% with the Palestinians. Half (50%) of white evangelicals said there is no way for Israel and an independent Palestinian state to coexist peacefully, a view held by just a third (33%) of U.S. Jews and 41% of the general public.